A Hero is defined by his Heroic Ego, which is an example of a Specialty. Specialties are special abilities, features, or skills that change the rules for a particular minifig or other unit. In most cases, a Specialty is used to grant abilities not available to units under the regular rules, but it might also be a handicap or a simple stat tweak. The effects and rules for any Specialty are listed on a unit's Stat Card for easy reference. A Specialty's CP cost is listed along with its description text. This added cost is already included in the total Cost of the card on which the Specialty appears. 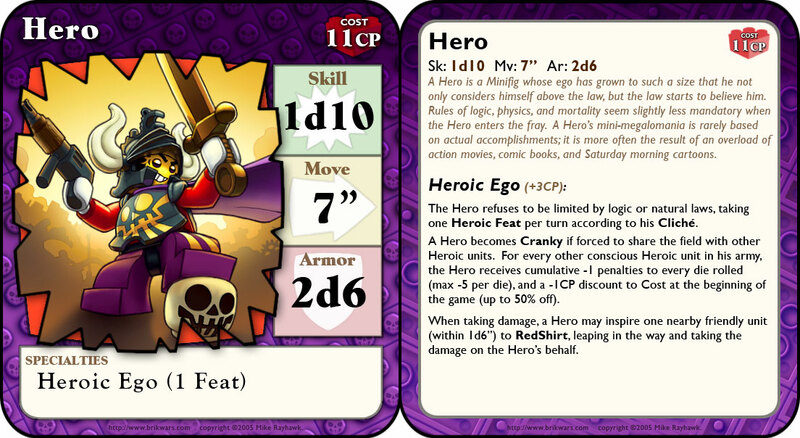 If you wanted to add the Heroic Ego Specialty to a different unit, it would increase that unit's cost by +3CP. Some minifigs are just better than others; you recognize them as soon as you open the box. Their superiority has nothing to do with talent, training, or genetics; the defining feature that separates Heroes from regular minifigs is their cool outfits. With shiny armor and flapping capes, there's no confusing a Hero with his inferior minifig comrades. Looking cool makes him fight better, live longer, and succeed where others fail. 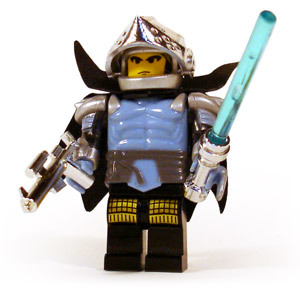 A Hero's standard attributes are significantly higher than those of a regular minifig. Heroes have a Skill of 1d10, are able to Move seven inches per turn, and have an Armor rating of 2d6. With a cost of 11CP, they're also a lot more expensive to field. Six-sided dice may be good enough for regular minifigs, but Heroes demand a higher standard. Preferably forged from solid gold. The difference between a warrior who's merely phenomenally skilled and a true Hero is a matter of Ego. No matter how high a regular minifig's stat numbers may be, he recognizes the fact that he'll eventually have to die, and that some rules just can't be broken. A Hero, on the other hand, admits no such things. Mortality, logic, and the laws of physics are beneath his notice. A Hero is above the concerns of lesser minifigs. Above all else, Heroes are the rock stars and prima donnas of the battlefield, and they insist on being more important than any other unit. He welcomes the presence of Heroes on the enemy team, because lesser foes are a waste of his abilities. A Hero on an allied but separate team gives him someone to compete with, and in any case he expects to get to stab them in their Heroic backs later when his Human's politics inevitably shift. Placing additional Heroes on his own team, on the other hand, is a major insult that no Hero can overlook. There can only be one star of the show, and he doesn't like getting upstaged. If a player fields multiple Heroes, their clashing Egos make each of them Cranky, and the more Heroes there are, the Crankier they get. For every other conscious unit on his team with an Ego, a Hero receives a -1 Cranky Penalty, down to a maximum of Crankiness of -5. 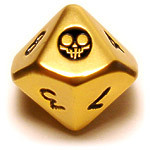 Any time the Hero rolls one or more dice, whether for Skill, Armor, Damage, Heroic Feats, or RedShirts, the Cranky penalty is subtracted from each die (total rolls can never be reduced below zero, however). The penalty is not subtracted from dice rolled against the Hero; he still receives full Damage from enemy attacks, for instance. Penalties for Crankiness only remain in effect while the other Heroes on the team are conscious. If the other Heroes are knocked out or killed, the penalty is lightened accordingly. If a dead or unconscious Hero is revived, the penalty is reinstated. The one advantage of a Cranky Hero is that he costs less. For every point of Crankiness a Hero has at the beginning of the battle, he costs one less Construction Point, up to a maximum discount of 50% off. Attacked by an evil clone at a publicity appearance, Blue Space Hero is saved by the intervention of a leaping red-shirted passerby. From photos taken at the scene, it's unclear whether the man's leap was intentional, or if the Hero picked him up and threw him in the way of the attack. Either way, he becomes the posthumous envy of Blue Space Hero fanboys across the galaxy. A Hero is more important than any regular minifig. As a result, it's only right that lesser troops sacrifice themselves to keep him from harm. Whether out of love, duty, fear, or the Hero grabbing them by the head and using them as a meat shield, a Hero can rely on nearby allies to leap into harm's way to protect him from damage. These self-sacrificing troops are called RedShirts. It's thought that they earned the name by so often donating large portions of their bodies to convert into a red splatter decoration covering a Hero's chest. Any time a Hero takes damage from an external source (i.e., not from something internal like poison, coronary disease, or from having swallowed a live grenade), he may try to inspire a nearby unit within 1d6" to RedShirt. This does not take an Action; the Hero can inspire any number of RedShirts in a single turn, but only one for each specific incoming source of Damage. If successful, the RedShirting unit will leap in to take the damage instead, knocking the Hero out of harm's way if necessary (for instance, if the Hero is about to be hit by a speeding locomotive, he'll need to be somewhere else when the train rolls in). 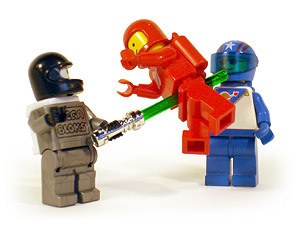 The inspired RedShirt must be on the Hero's team, it must be capable of leaping (e.g., minifigs, robots, and animals; not tanks or jet fighters, for instance), and it must have a lower CP cost than the Hero (not counting equipment). When a Hero learns that he's about to take Damage, he has one chance to inspire a nearby RedShirt to save him. Before the Damage is rolled, the Hero chooses one nearby eligible unit to sacrifice. He rolls 1d6 (plus any Bonus Dice, on a Critical Success). If the unit is within this many inches of the Hero, the inspiration succeeds. The sacrificial unit will leap in and take the damage intended for the Hero, and if necessary, the Hero is knocked away the minimum distance required to avoid being hit (even if the distance required is truly riduculous, like getting RedShirted out of a nuclear explosion or a supernova). If the roll is too low or is a Critical Failure, the Hero fails to inspire the unit to RedShirt, and is forced to take the damage himself. If the Hero is in a Squad, other Squad members are automatically inspired to RedShirt on his behalf, without having to make the 1d6" distance roll (Chapter 8: Squads). RedShirts move unusually quickly and have no problem intercepting gunshots, explosions, or even laser blasts. They're unconcerned with whatever damage this might do to the laws of physics or to players' suspension of disbelief. RedShirting should not be abused to try and accelerate units' movement across the battlefield. This will make the Hero's allies want to kick him in the nuts rather than sacrifice themselves for him. A player trying to force a RedShirting by attacking his own Hero is engaging in the stupidest form of rules lawyering. He should be ejected from the game and all his bricks should be confiscated by the other players. The remaining players may then take turns RedShirting him out of the house and into the street. A Hero's amazing abilities stem from both stunning bravado and pig-headed ignorance, but his greatest powers are drawn from a tradition handed down through endless generations of action movies. Which action personality best fits this hard-hitting space marine Hero? Characters from Futurama are proposed, and a nomination for Duke Nukem is met with popular acclaim. But love for Samuel L. Jackson wins out in the end, with the suggestion of "Mace Windu, as played by Jules Winnfield." Attitude firmly in place, Commander "Bad" Moe Faux is born. To realize their full potential, all Heroes must take on an Action-Hero Cliché, drawn from movies, video games, comic books, or Saturday morning cartoons. It is almost mandatory that Heroes develop a ridiculous accent in support of their role. In a pinch, an Austrian accent almost always works; if a role hasn't been played by Arnold Schwarzenegger, it probably doesn't count as a real Action Cliché. 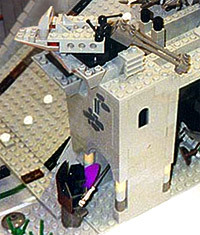 For Heroes based on specific characters, picking the Action Cliché is easiest of all: a Robin Hood minifig would perform Robin Hood Feats; a Hercules minifig would have Herculean Feats, and a Davy Crockett minifig would get King of the Wild Frontier Feats. The failure of Brendan's Hero to leap to the top of this security tower landed him head-first in a garbage can. After failing three such attempts in a row, the trash bin was ruled to be a permanent part of the Hero's outfit. For an action-movie hero in the thick of battle, accomplishing the impossible is more than just an everyday event - it's an every-couple-seconds event. Any such stupendous or wildly improbable act, pushing fictional license to its limits for the sake of spectacle, is a Heroic Feat. Heroes are limited to the Feats appropriate to their Cliché - a ProWrestler Hero can't calculate energy-shield bypass frequencies off the top of his head the way a ScienceOfficer Hero might, but he can try picking up a motorcycle and swinging it like a baseball bat through a group of opponents. To attempt a Heroic Feat, the player describes the Feat his Hero is about to attempt, and rolls 1d6. If one of his opponents would like the Feat to fail (and they probably will), he also rolls 1d6. If the Hero's roll ties or exceeds the opponent's roll, the Feat succeeds; otherwise the Hero's efforts end in failure. A Hero may attempt one Heroic Feat on every turn. If he doesn't use his Feat during his own turn, he may use it as a Response Action during an opponent's turn at no penalty. If he doesn't use the Feat before his next turn, it's lost; Feats reset at the beginning of a Hero's turn and can't be "saved up" over time. Because the range of possibilities for each type of action hero is so wide, it's up to the players to agree on whether a specific Feat is appropriate to a given Cliché, what the effects of success will be, and what will be the consequences of failure. The effects of failed Feats will depend on the seriousness of the battle and the attitudes of the players, but a good general guideline is that the more stupendous the Feat attempted, the more dire the effects if it fails. A Hero failing an attempt to eat a dozen doughnuts in a single turn might suffer the effects of upset stomach. Choking to death might be a more realistic result, but it'd be a little severe compared to the relatively uninspiring Feat. A Hero failing to lift an automobile over his head, on the other hand, would be subject to much stronger consequences on failure: he might get it into the air but then drop it on himself, or he might strain so hard to lift it that he rips his own arms off. It's often best to start by imagining what would happen to Homer Simpson if he were attempting such a Feat.